Phillip Craven on Gadgets: Getting too fast? maniacinternet on Gadgets: Getting too fast? Dave on Gadgets: Getting too fast? Mikael on A yearning to bake bread. Julie on Gadgets: Getting too fast? jasa seo on Gadgets: Getting too fast? Receive an email every time Cooking at Case is updated. When I was a little girl, helping out in the kitchen was one of the most fun "help mama" activities (topped only by sewing, of course). 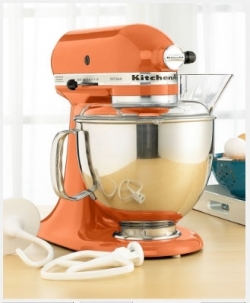 My memories contain remnants of the sensory experience: sticky hands, brown sugar-coated tongue, sunlight streaming through the windows, fresh-baked cookie scents, and, of course, the steady ka-chunk noise of the Kitchen Aid mixer. My mother swears by her Kitchen Aid, and has promised that my kitchen will never be incomplete because my own mixer will be her first gift to me on my wedding day. The Kitchen Aid is an extremely useful tool. Its heavy base and thick gears manage to spin the densest doughs, and the plethora of attachments available simplifies many daunting cooking and baking endeavors. In my kitchen at home, it stands out no more than the toaster, blender, or microwave. But where do gadgets cross the line from useful helpers to overachievers? This New York Times Article explores the recent evolution of appliances, citing a toaster that poaches an egg as the bread is toasted. The NYT refers to America as a nation of "index-finger cooks" and says that we enjoy the satisfaction that comes from making something, even and especially when that something requires little to no effort. Housewares sales have been dropping in recent times, but small kitchen appliances have been selling very well lately. Microwave meals, frozen pizzas, and envelopes of cookie dough are appealing because they are convenient while retaining at least a smidge of that "i made it myself" feeling. But what are we losing when we give up being able to lick the batter off the beater? One-button cuisine offers ready answers for cooks with not much time to spend in the kitchen and not much of a clue about what to do once they get there. The orange Kitchen Aid mixer of my future kitchen might save my arms some strain, but it is by no means a one-button machine. I will still be measuring, sampling, and modifying during every bit of the baking process. And I most certainly will have a clue about what I'm doing, because I can hear my mother's guidance right along with that distinctive Kitchen Aid stirring noise. There is a boundary between those appliances that make kitchen tasks more enjoyable and those that take all of the work, pleasure, and process out of them. If more people started with Kitchen Aid mixers than toaster ovens complete with the "pizza bump", I think we'd be witnesses to an entirely different food culture. A yearning to bake bread. The readings and class discussions lately have been inspiring me to think about food in many new and different ways. I have always loved baking, and more recently have started cooking more, but my mentality has changed. I have typically been a "box-cake person". I try to save time and money and effort by dumping box cake powder in the bowl, adding eggs and water, and popping it in the oven. Easy. Box cakes aren't bad. They're good! And with how I (and most of us) have grown up, they taste like childhood birthdays and smell like sweet trouble-free times. But when we look at food preparation as a craft - not an art, as Ruhlman vehemently states in Soul of a Chef - the box cake suddenly appears less worthwhile. Once we recognize the act of preparing a dish as an enjoyable way to spend time, it almost feels like we're cheating ourselves when we take shortcuts. Why take shortcuts on leisure time? [Breadbaking is] one of those almost hypnotic businesses, like a dance from some ancient ceremony. It leaves you filled with peace in a house filled with one of the world's sweetest smells. But it takes a lot of time. Once you find that, the rest is easy. If you cannot rightly find it, make it. There is no chiropractic treatment, no Yoga exercise, no hour of meditation in a music-throbbing chapel, that will leave you emptier of bad thoughts than this homely ceremony of making bread. Baking bread is something that has always seemed too challenging to be worthwhile, and has never been necessary; the grocery store isn't so far that it would ever be advantageous to "whip up" a batch of bread rather than making the drive. But the smell, the texture of fresh homemade bread cannot be compared to anything else. There's also the community aspect: bread is made to be shared, to be torn or sliced and passed among family and friends. It has religious significance, in that everyone is sharing and has part of the whole. Maybe it's just midterm week, and kneading bread seems like the perfect repetitive motion to keep my brain and spirit in check. Maybe I'm just caught up in the spirit of M.F.K. Fisher, Julia Child, and even Bill Buford, thinking that any dish is worth the effort. Maybe, and I think quite possibly, baking bread is every bit as rewarding to the senses and the soul as Fisher has described. I'll be back when I find (read: make) the time to bake my first loaf of bread.